From Moms to Grandmas: Hello my fabulous friends! 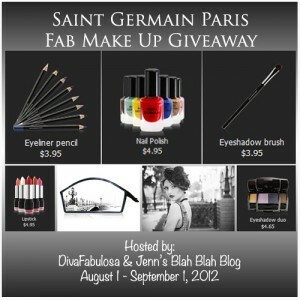 Here’s a blogger sign up for a Saint Germain Make up Giveaway! Hello my fabulous friends! Here’s a blogger sign up for a Saint Germain Make up Giveaway! Hello my fabulous Blog friends! Here’s a blogger sign up for a Saint Germain Make up Giveaway! This event is hosted by Diva Fabulosa and Jenn’s Blah Blah Blog This event will run from August 1 until September 1. We will be giving away 20 cosmetic bags with some fabulous content! $450 total worth!! The Giveaway is open to US/Can residents. What you get! If you are interested in joining us for this wonderful event you’ll receive 1 Facebook link on the Rafflecopter FREE! If you would like additional links there will be a fee of $2 per link. If you wish to receive a free Facebook link on the Rafflecopter we ask that you blog about this event, the more people we get to sign up the better the event will be for us and our readers! We will send the HTML on or before July 27. If you are buying additional links please send all payments to samcj7@gmail.com If you would like to host a page on your blog you can leave your bid. Co-hosts spots available for $10 as well. Be sure to join BlahBlahBloggie Giveaways Facebook Group! here Be sure to join BlahBlahBloggie Giveaways Facebook Group!